The second volume of memoirs of President of India, Shri Pranab Mukherjee titled “The Turbulent Years – 1980-1996” was released today (January 28, 2016) at a function held in Rashtrapati Bhavan. The book was released by Vice President of India, Mohd. Hamid Ansari before an invited audience. Speaking on the occasion, the President said the first volume “The Dramatic Decade- The Indira Gandhi Years” was released on December 11, 2014 and he had committed to his readers that the second volume would come out in one year, i.e. by December 11, 2015. Unfortunately he could not keep this commitment and the book is coming out only today. The President said he has had the good fortune to be a witness and, sometimes, a participant in many momentous events of the 1980s and 1990s. This volume is an account of major events from his perspective. He has the habit of writing a page in his diary every day. The basic material in this book are from his own diaries. He has however, adopted a conservative approach. He has held many sensitive posts over his long career in public service and was bound by oath not to divulge any information he may have come to know as Minister. It is his conviction that some facts are never to be revealed. Speaking on the occasion, Vice President Mohd. Hamid Ansari said the book is a commentary on our times and the age in which we live. It has several pertinent observations on the nature of Indian polity and Indian federalism which needs to be read carefully. Commenting on the book, Dr. Karan Singh, Member of Parliament said the book is of great value because of the assessment of various personalities in it, description of major events of the period and the light it throws on important economic issues of that time. He said the most fascinating aspect of the book is the description of President’s political career with its remarkable ups and downs. He described the President as a highly intelligent, seasoned and gifted politician, blessed with tremendous memory and great intellectual stature. 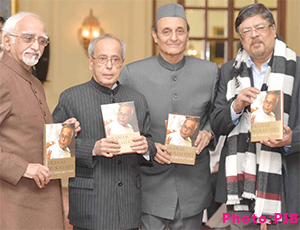 Dr. Chandan Mitra, Editor, Pioneer said the book shows that Shri Pranab Mukherjee was a keen observer of events with an unparalleled memory and strong commitment to democracy. The candour with which Shri Mukherjee approaches events is the highlight of this book. He said this book should be made mandatory reading for every student of political science and be part of university curricula.